There’s this idea that once we grow up we should put away our childhood. Why? Who’s to say that those of us that once enjoyed MOTU, TMNT, G.I. Joe, and X-Men toys cannot continue to enjoy them? How about going further to create, recreate, or critique action figures? Let’s explore this idea further in future posts, perhaps in reviews hinted at with this preview photo? Until then, here’s our subjective review structure. 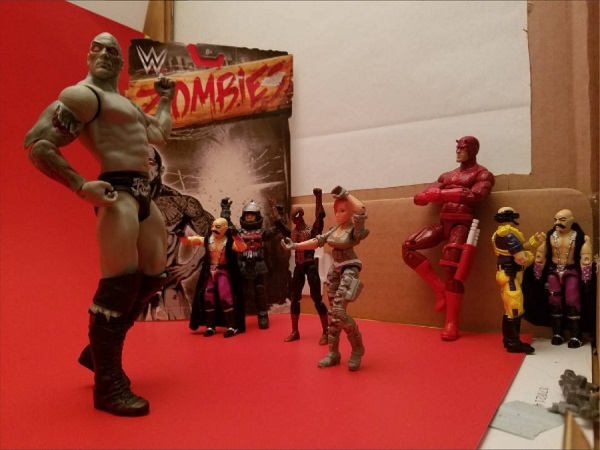 Previewing: The Rock, Undertaker, Fearless Photog, Corps! Ogre versus Snakebite, Spider-Man, and Dr. Mindbender. How do the proportions look? Does it look good? While I haven’t studied anatomy more than owning Gray’s Anatomy, and Collector got a C in high school Anatomy, we generally have an eye when something seems off. We’re not marking off points if the sculpture doesn’t match human anatomy. It’s more about whether the design is accurate to the character or fits a specific artistic design. We’d also be looking for design flaws or if the sculpting just looks bad. Sloppy or clean? Missing paint applications? I took a college art class, a brief tutorial on badly painted cars, and have painted the interiors of some houses, so for example I can spot a sloppy paint job between the wall and ceiling ten feet away. Collector just appreciates the value of a clean paint job. We’ve both considered customizing, so maybe when we find flaws, we can then find a good opportunity to attempt to fix sloppy or missing paint? Is it a brick? Can you get it into any cool poses? Starting off with a bias: I’m not generally a fan of the old school five points of articulation: right shoulder, left shoulder, right leg, left leg, and head rotation. There can be exceptions, such as if it’s appropriate for the character. It’s just that poor articulation is limiting at best and cheap at worst. There’s also the counterargument: the character’s design is so articulate that it can’t stand. How does one character look against the others in the series? How about other series? 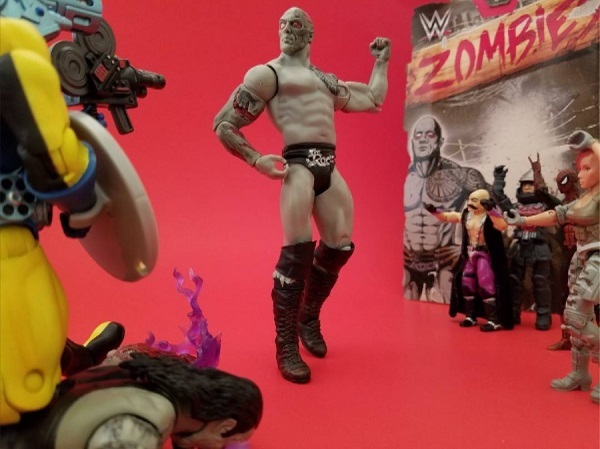 Some of the appeal of collecting action figures is displaying them in cool poses. A large team posed in either an iconic shot or in a unique situation can be very satisfying. I also dig when you can have multiple characters from different stories in one scenario, such as the above photograph, or having a “red team” versus a “blue team” according to their costumes. Recommended to fans, anyone, or no one? How could it be improved? We’re just fans. We got the item in question because we like the character or it was cheap enough to where we figured why not? Fortunately, unlike going to a disappointing concert, reading a poorly written book, or playing a broken videogame, we can change the product we receive. Some paint and time can fix many of the quality control problems that still unfortunately often plague action figures. [Applied Psychology] No Tail Pullin’!